MagiCat from Toge Productions is simply an incredibly solid two-dimensional platformer. That sounds like faint praise, but I swear that it really isn’t. It’s the product of a single person studio and is really a remarkable piece of game craft. Everything about it is just well made. Which is our theme for today. Just straight up quality games. No nonsense. 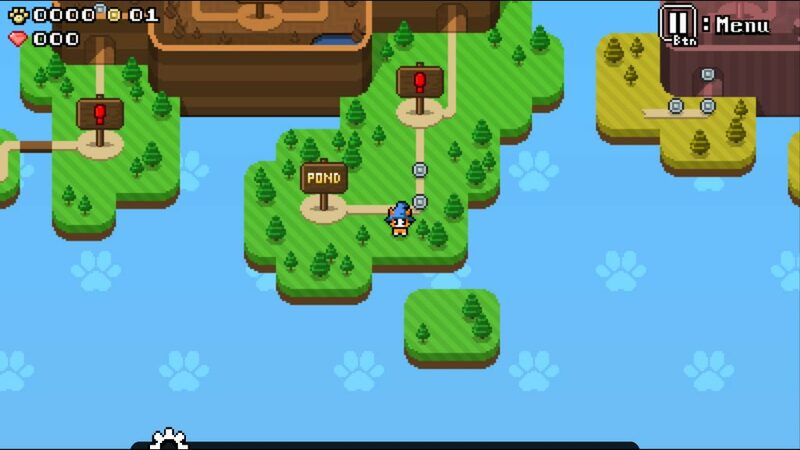 The graphics in MagiCat are super cute. You’re a cat in a wizard hat for crying out loud. * How can you not love that? You spit hairballs at slimes. Magic hairballs. So cute. Just good pixel art all around. The bulk of the enemies are palette swaps of of couple basic forms, but I don’t hate that. The basic forms are well executed (cute slime & cute bat being the most common) and the pallet tells the player exactly what they are in for. Each level is unique and colorful with clearly defined goals. None of the graphics are things that you haven’t seen before, they’re just done really well. Part of the charm of MagiCat lies in it’s simple yet elegant structure. 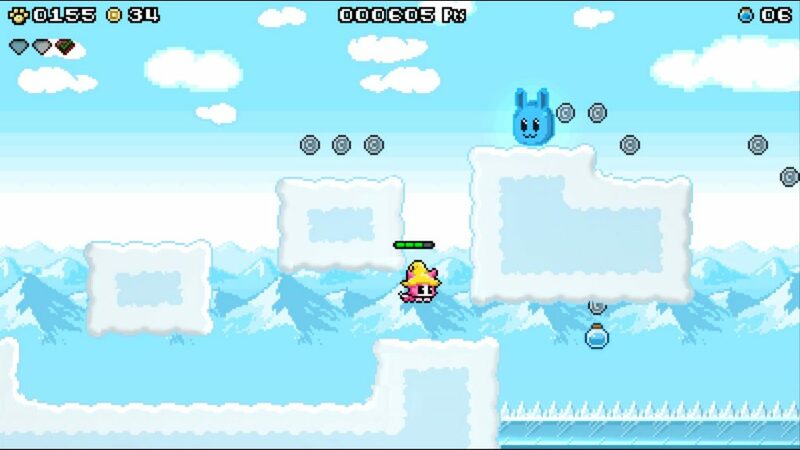 Each level in MagiCat consists of three platforming sections and then a boss. In every platforming section there is a bonus red gem you can collect if you are so inclined which allows for some added elective challenge. At some point you’ll want to cash in those gems for special abilities (they are MagiCat’s currency), but I really like how they’re structured so a player can choose their own difficulty. The secret is in the pond. 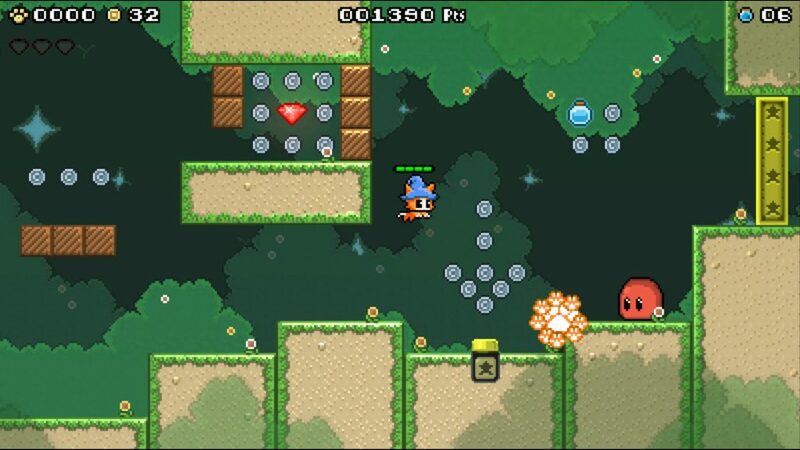 Each level has it’s own mechanic. Maybe one is rolling platforms. Another might be switch blocks. Another would be a shrinking mechanic. I liked how focused this made every level. The player has to understand the mechanic to complete the level, but if they want to get all the red crystals they need to master it. Again, this is another example of MagiCat’s design ethos. Seemingly simply well constructed levels that allow the player to learn at their own pace. At the end of each level you fight a boss which is usually a larger version of a level enemy and incorporates the level mechanic. I found these a bit of a mixed bag. Some were really trivial and some were super difficult. But there were a lot of them that I thought were extraordinarily clever. They felt like cool tests of the level mechanic. I’m not a big boss battle fan, but the bosses I liked in MagiCat I really liked. Ice rabbits are worst rabbits. I’m not really sure what else to say about MagiCat. 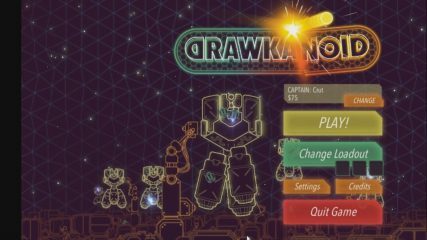 The controls feel good, the graphics are cute and fun, and the level design is top notch. It’s not a revolutionary game by any means, but I don’t think it needs to be. It’s really fun to play, and I think other developers could learn a bit by checking it out. I think you should play it our I will cough a hairball at you so hard. *Notably this means that MagiCat passes the Wizard Test with flying colors. All games should have wizards in them.